To resolve the weird “ERROR: Missing required OpenGL extensions,” set the environment variable force_s3tc_enable=true. Thanks to the game’s forum. I bought Mini Metro when in a GOG sale recently. It’s more challenging than it looks. My most effective Mini Metro strategy yet consisted of aggressive line doubling. The tutorial is lackluster at best. It shows you how to connect two cities and how to add trains to lines, even though these are pretty much the only truly intuitive things about the game. It doesn’t tell you that there are little symbols like squares, circles and triangles in the carriages that indicate where the passengers want to go. It also doesn’t tell you that you have to drag the track over a city to undo it, or that the top right features a clock with the day of the week as well as the ability to increase speed (very important) and to pause. If the game manages to captivate me for another few hours I might look up what strategies people have come up with. The one shown in the screenshot is the first I tried that got me to 1500 passengers with ease, whereas I was stuck at around a 1000 before then. The game doesn’t seem to tell you your total playtime, but by counting up the individual levels I can see that I already spent 134 minutes playing it in the past three days. Washinton DC is the 14th level. It doesn’t have quite the charm of a Railroad Tycoon, but there’s something oddly satisfying about the game. 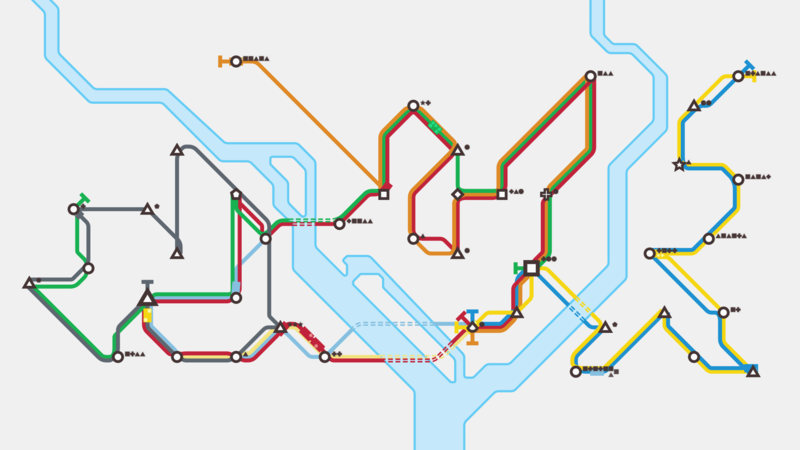 Mini Metro might be worth a try if the idea of a simpler Railroad Tycoon sounds appealing. The fact that the Broken Sword 5 2.2 20th anniversary update added controller support (also in Linux) is pretty good news. It works ever so slightly better than the antimicro setup I was using to play. But one of the primary reasons it works better is that they’ve also fixed up keyboard support. You can now press up and down arrows like you always should’ve been able to. Meaning my previous antimicro setup works better as well, in spite of it having been made obsolete.